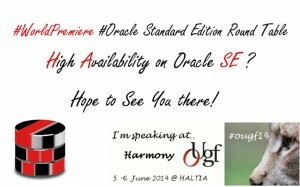 Pipelined Table Function in Standard Edition | Oracle Standard Edition – Just love it! Pipelined & Parallel Table Function in Standard Edition? Earlier today I received a question from Mr. Lothard Flatz concerning a featured that to my understanding has been available since Oracle9i. Thank you Lothard. And without any further information, I assume this question targets the database version 11gR2 or 12cR1. To be frank, my first thought was “yes this is ok to use in a Standard Edition Database”, but after reading more about this feature, I started to hesitate and doubt my own answer. Why? Please keep on reading, and you can judge for your self, am I making the correct assumptions or not. Hopefully somebody among my peers can either verify or correct my assumptions in the end of this post. Oracle licensing is a complicated business. The notes here are only a guide. You should always discuss your licensing with Oracle License Management Services or any other third party company, who are classified as professionals on this business. 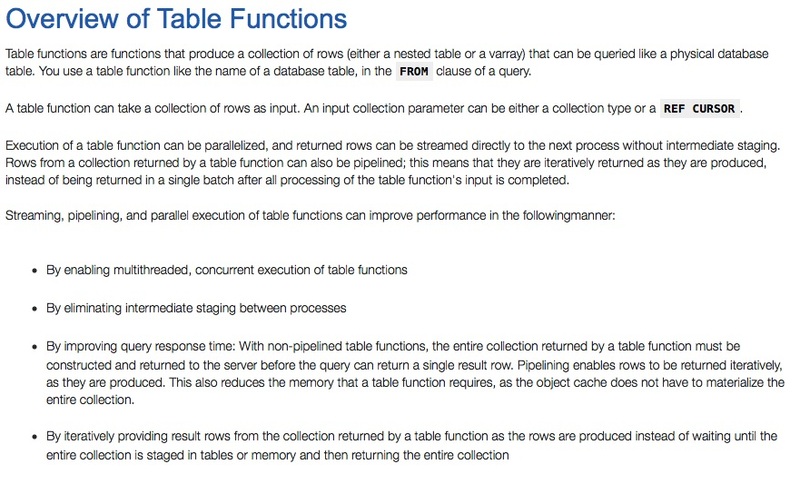 What is this Pipelined Table Function? And while you are making your self acquainted with the subject, why not also read this article from Tim Hall about this feature before continuing. “parallel execution” – in standard edition? As you noticed from the picture above, Oracle documentation mentioned the word “parallel execution”, and that is always generating the question “is this ok in a Standard Edition Database environment, or not“. We can only find something on the PL/SQL Function Result Cache. I assume this is referring to the RESULT_CACHE clause, since that will to my understanding, boost the performance by reusing function results, instead of recalculating. From the internet, we can find more information about RESULT_CACHE from either this post by Tim Hall or from the reference guide from 12c. Yes, to my understanding one of the features is available in our Standard Edition Database Environment – the Pipelined Table function. Exactly one REF CURSOR is specified with a PARTITION BY clause- I hope somebody among my peers could verify or correct this assumption. As I mentioned earlier. 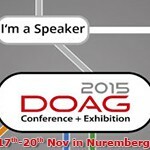 The last resort when unsure, is asking Oracle for assistant.